Comprehensive toolkit for generating various numerical features of protein sequences described in Xiao et al. (2015) <DOI:10.1093/bioinformatics/btv042> (PDF). Nan Xiao, Dong-Sheng Cao, Min-Feng Zhu, and Qing-Song Xu. (2015). protr/ProtrWeb: R package and web server for generating various numerical representation schemes of protein sequences. Bioinformatics 31 (11), 1857-1859. Browse the package vignette for a quick-start. ProtrWeb, the Shiny web application built on protr, can be accessed from http://protr.org. 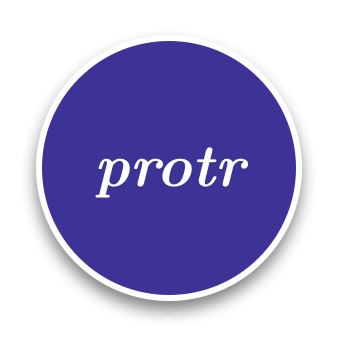 ProtrWeb is a user-friendly web application for computing the protein sequence descriptors (features) presented in the protr package. Developed by Nan Xiao, Qing-Song Xu, Dong-Sheng Cao.